No matter the time of year, Identity strives to leave a mark in the local community through numerous charitable endeavors. No matter the time of year, Identity strives to leave a mark in the local community through numerous charitable endeavors. But the holidays always present a significant opportunity to help support those who are less fortunate. This year, Identity again partnered with Starfish Family Services, a community-based organization serving vulnerable children and families in metro-Detroit, to adopt families and help enhance the lives of disadvantaged individuals. Starfish was previously a pro-bono client at Identity, but it didn't take long for the firm to become entwined in the services offered by Starfish after witnessing first-hand how important they are to local families. Even beyond the holidays, many Identity employees donate their personal time and financial resources toward helping Starfish. For 2012, Identity and its employees created a truly unique holiday giving experience that allowed each employee to become personally engaged in the initiative. First, tags were hung on a small Christmas tree in a central location of the office. Each tag included the name of a family or family member, as well as one item they wanted or needed for Christmas. Items ranged from paper products like toilet paper and paper towels to storage bins, books, toys, shoes, and clothes. Identity employees were encouraged to select tags from the tree and then personally shop for the items listed on the tag. Then, as gifts were purchased, they were brought into the office and placed beneath a Christmas tree. Identity purchased wrapping paper and organized a wrapping party where all of the presents were prepared for delivery. Finally, Identity employees delivered the wrapped gifts to Starfish for distribution to the families and children. 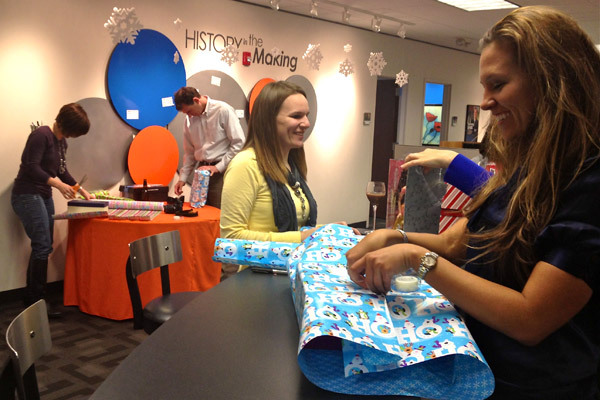 From choosing which charity to partner with to buying the gifts, wrapping them, and delivering them to Starfish, Identity employees are the driving force behind the company's holiday giving initiative.